With the wide array of online threats, it’s crucial to protect your PC online. There are many great security tools, and speaking of which, Bitdefender released the latest version of its security software recently. 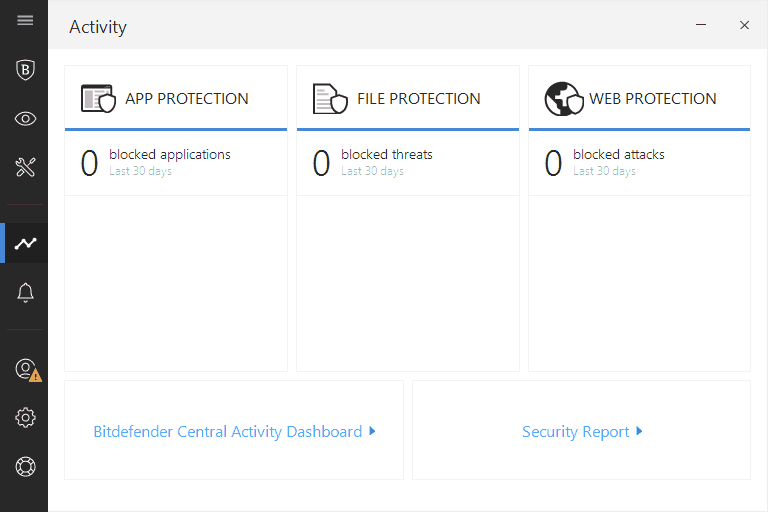 The new version of Bitdefender Total Security comes with many new features, so without further ado, let’s see what this tool has to offer. 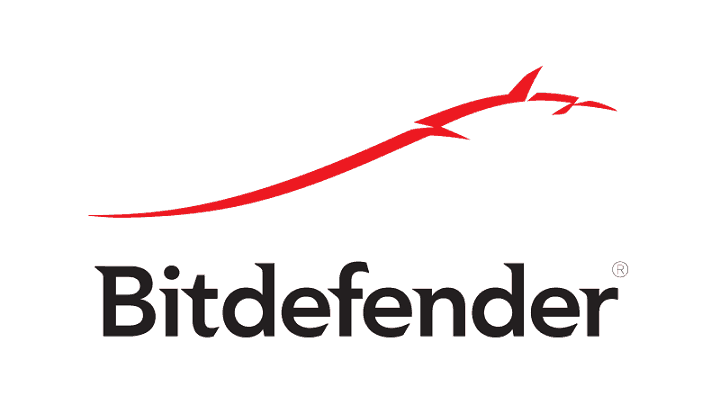 Bitdefender Total Security 2018 is the latest entry in the long list of security software from Bitdefender. Before you can start using this tool, you need to create your Bitdefender account. The account creation process allows you to log in using your Microsoft, Google or Facebook account, allowing you to set up your Bitdefender profile in a matter of moments. After installing Total Security 2018, you’ll be greeted with a modern and friendly user interface. 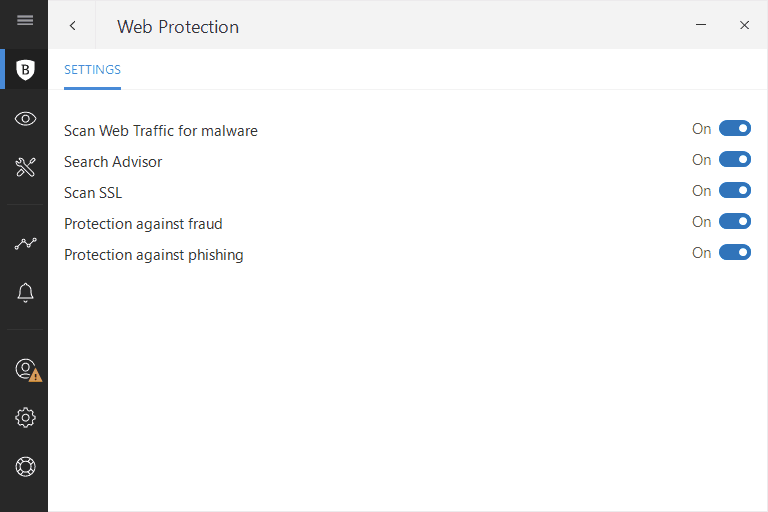 The dashboard allows you to see important information such as blocked apps or detected threats, but you can also update antivirus definitions right from it. In addition, you can easily perform a Quick Scan from your dashboard. 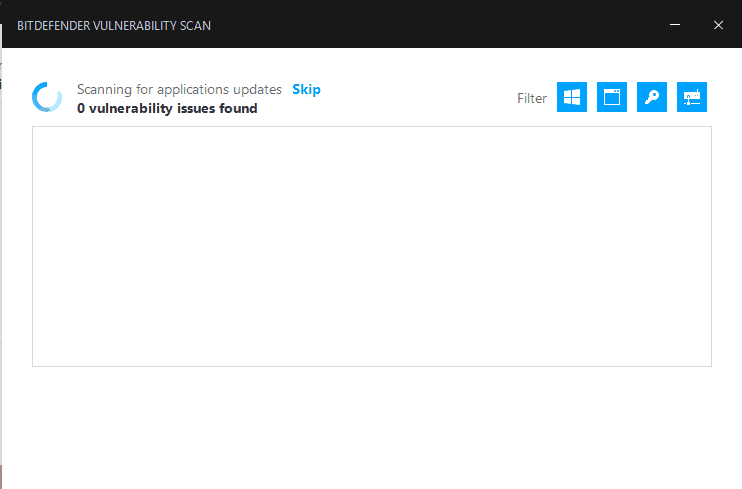 You can also perform a vulnerability scan that will check if you have critical Windows and application updates installed. 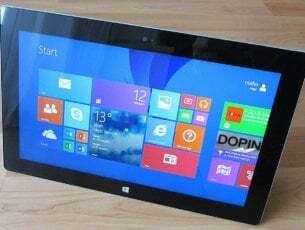 This feature will also check your Windows account passwords and Wi-Fi network ensuring maximum security. 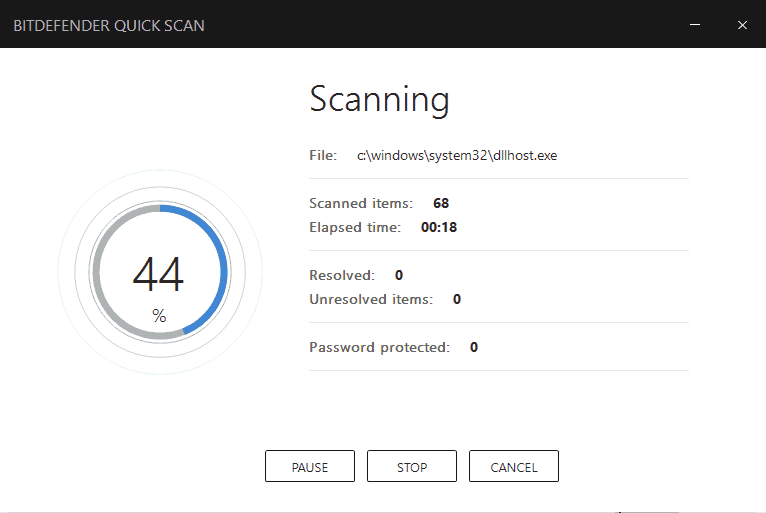 As for additional features, you can also perform a System Scan and scan your entire PC for malware. The application allows you to create custom scans as well, so you can easily choose which directories you want to scan. In addition, you can schedule your scan and run it periodically or at system startup. It’s worth mentioning that you can choose between three different scanning methods in order to achieve the best results. Keep in mind that different scanning methods might require more computer resources. The application allows you to set a list of excluded files and folders, and it will automatically scan all USB devices and optical media for viruses. We also have to mention that Bitdefender Total Security 2018 offers Rescue Environment that you can use for most serious malware infections. The application has a powerful antispam filter so you can easily add a domain or an email address to the list of spammers. There’s also a web protection feature that can warn you about malicious websites. 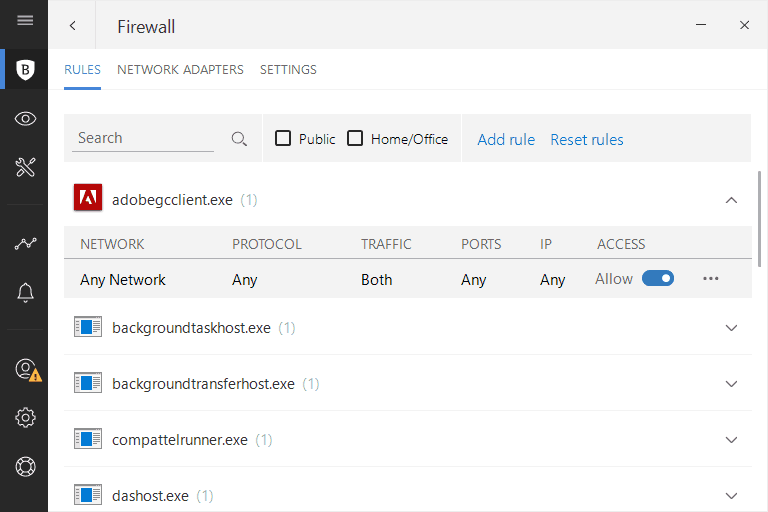 The application scans your network traffic and it can detect fraudulent or phishing websites. In addition, there’s also a Search Advisor feature available to protect you from online threats. 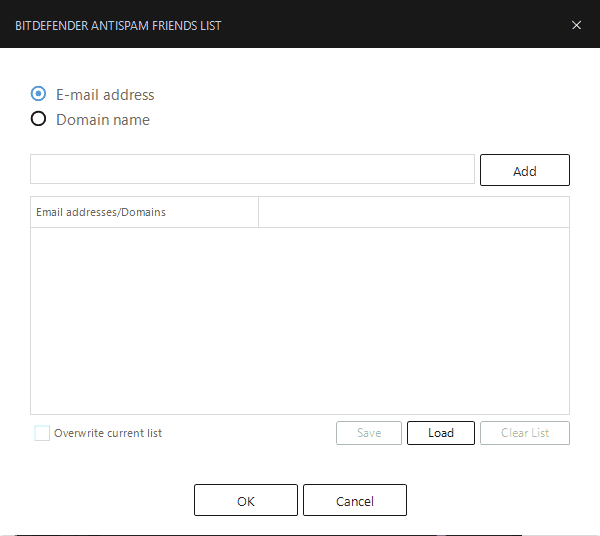 We also have to mention whitelist feature that allows you to exclude certain websites from being checked by Bitdefender. The application has a built-in firewall allowing you to control which apps can access the Internet. You can create custom rules for your apps and customize them the way you want. If you want extra security, you can use Stealth Mode and make your computer invisible in your network. 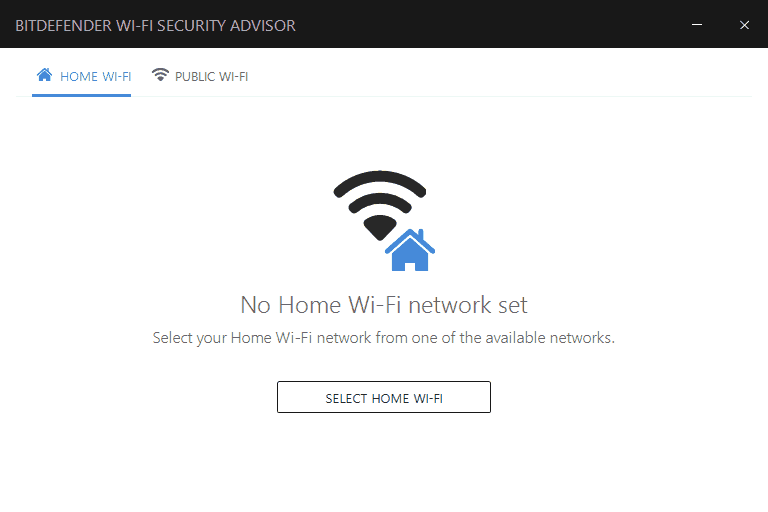 If you use a wireless connection to access the Internet, you’ll be pleased to hear that Bitdefender has Wi-Fi Security Advisor feature that will help you protect your device from security threats in your network. 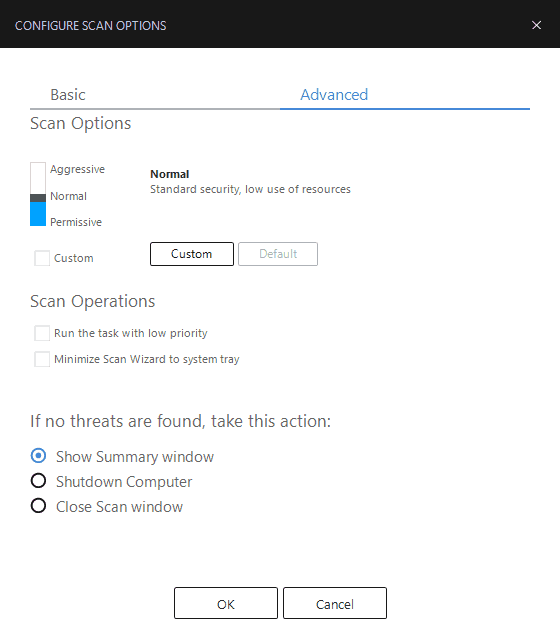 To achieve maximum security, the application uses Threat Defense feature to actively monitor your PC. If any suspicious application is detected, this feature will block it instantly to prevent any damage to your PC. There’s also a Ransomware Protection feature that will protect your PC from all ransomware threats. Bitdefender also has a Safe Files feature that can prevent applications from accessing certain folders. This is a useful feature if you want to protect sensitive data from unknown applications. Of course, you can set a list of trusted applications allowing access only to the verified apps. Bitdefender Total Security 2018 can also protect your sensitive information during online purchases. The application has a Safepay feature that starts a secure browser that will protect your sensitive data. In addition, this feature will also protect you from online frauds. It’s worth mentioning that this tool can automatically enter your billing information making online transactions simpler and faster. There’s also a built-in password manager feature so you can easily store your passwords or billing information. All data is stored in a secure vault, so third-party users won’t be able to access it. There’s also a Parental Advisor feature that works as a parental control software. Using this feature you can monitor your child’s online activity as well as time spent online. This feature works with Bitdefender Central allowing you to monitor your child from any device or operating system. 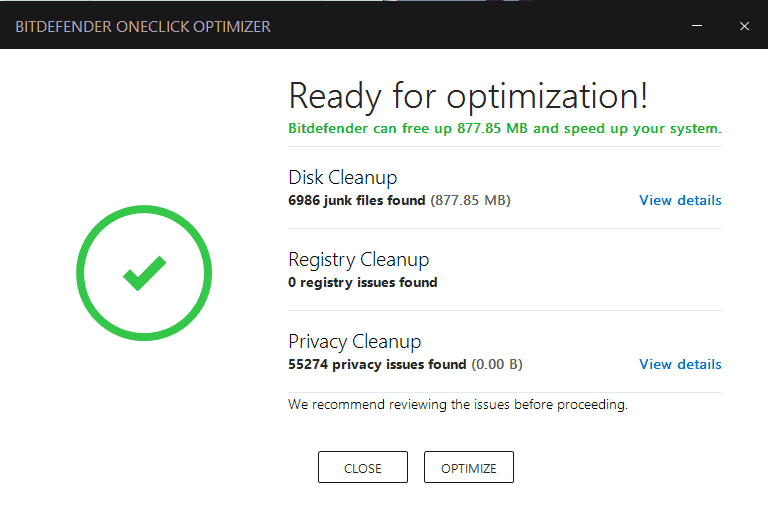 Another useful feature is OneClick Optimizer. Thanks to it, you can easily clean junk files and registry and improve your system performance. 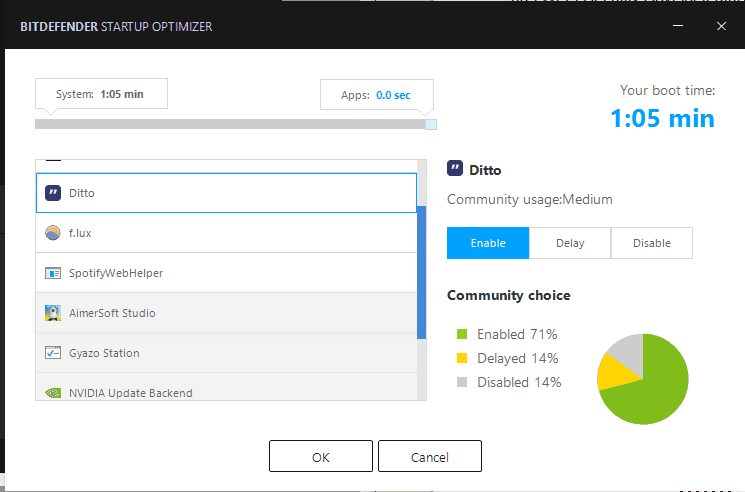 There’s also a Startup Optimizer feature that works as a startup manager. Thanks to this feature, you can see startup applications and disable or delay them right from Bitdefender Total Security 2018. The application also has an anti-theft feature, so you can protect your devices even if they are stolen or lost. This feature uses Bitdefender Central, so it’s accessible from any operating system or device. 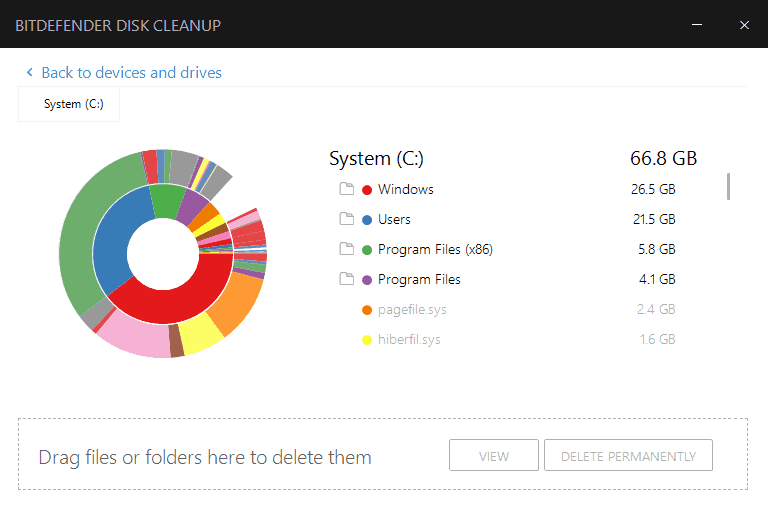 Another useful feature is Disk Cleanup that allows you to free up space on your hard drive. To use this feature, simply select the drive you wish to scan and the application will analyze it. Once the scan is complete, you’ll see a pie chart along with the list of directories that take up the most space. You can navigate through directories and delete them permanently right from the application. 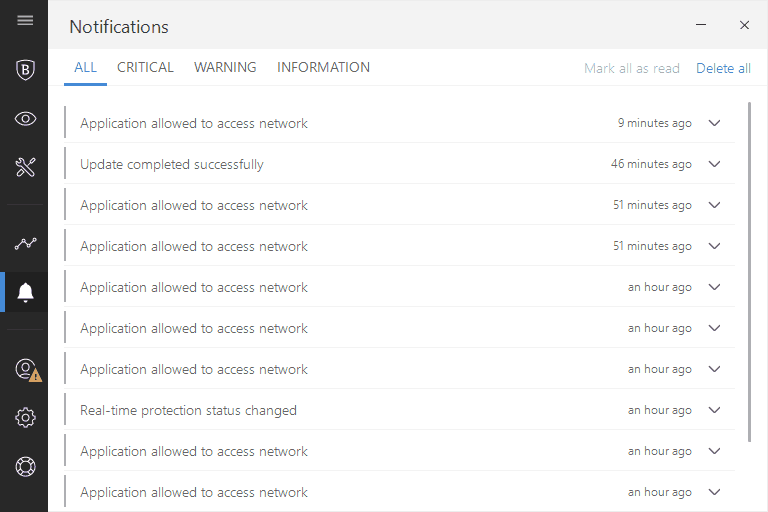 The application also allows you to check your activity so you can easily see blocked applications and threats. If needed, you can also see a detailed security report. Bitdefender Total Security 2018 also has a powerful notifications section allowing you to see all your notifications. You can filter your notifications and see only critical notifications, warnings or other information. Thanks to this feature, you can keep a close eye on all activity on your PC. As for additional features, the application offers password protection, so you can easily lock it and prevent other users from making changes. In addition, the application can protect your hosts file, so you can see if any application makes changes to it. 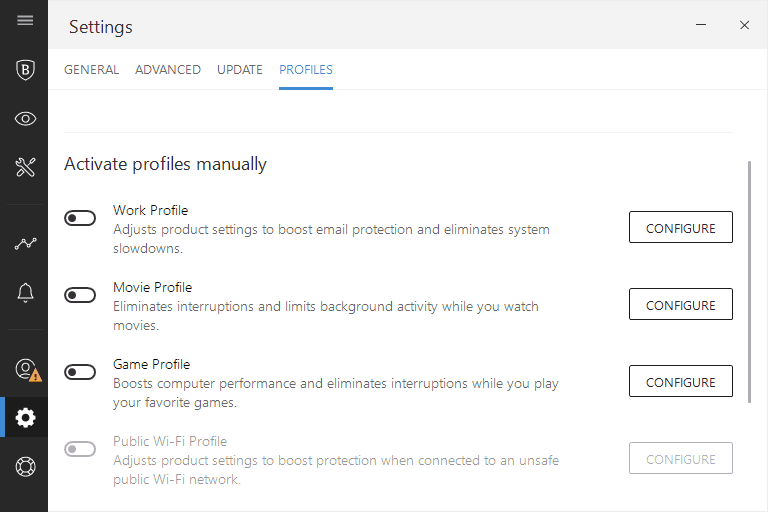 Bitdefender Total Security 2018 also comes with several available profiles that you can use to optimize your performance and protection. Each profile is customizable so you can easily configure its settings. There are some extra features such as social network protection that will scan social networks for malicious links. There’s also a file shredder feature that allows you to permanently delete your files. One new feature is a webcam protection, and thanks to it you’ll get a notification as soon as any application tries to access your webcam. 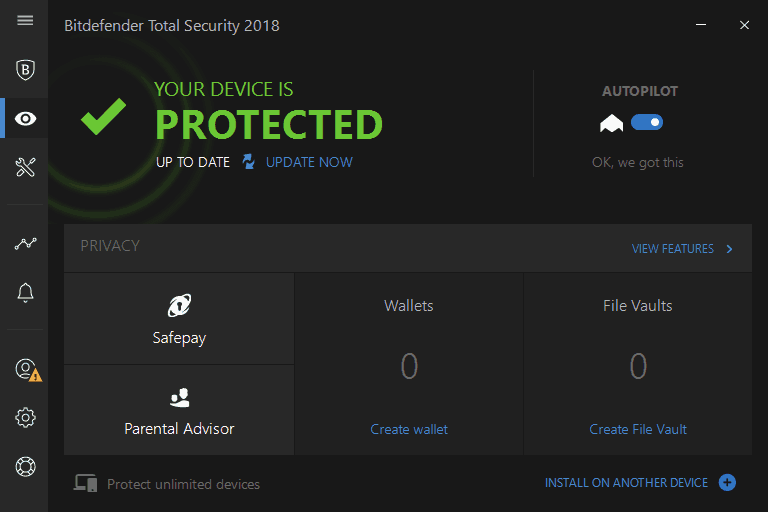 Bitdefender Total Security 2018 offers a wide array of features, and some of these features might be confusing to new users. However, the application has an Autopilot feature that will automatically configure your security without any pop-ups or security dialogs. Thanks to this feature, you won’t even know that Bitdefender is running in the background. Bitdefender Total Security 2018 offers simple and modern user interface, so you won’t have any problems using it. As for protection, this tool offers a wide array of features, so it will provide complete protection from all online threats. The application offers great performance and protection, and it’s definitely the best antivirus software on the market. 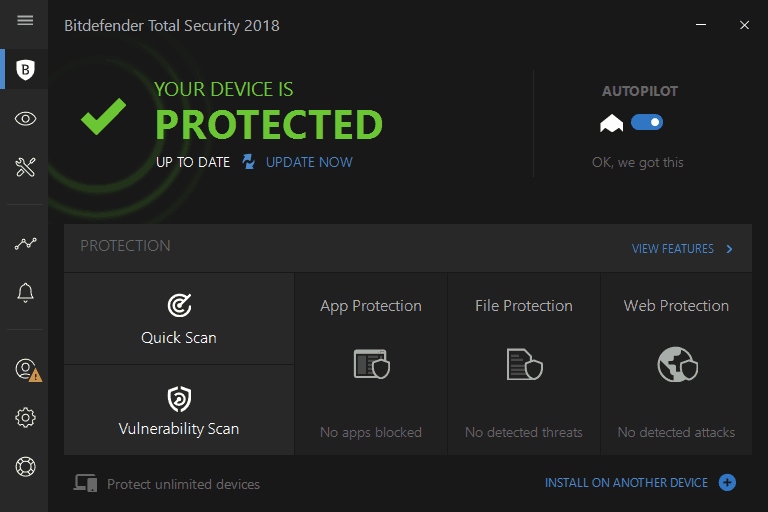 If you’re looking for a complete security software, we strongly recommend to try Bitdefender Total Security 2018, it’s definitely one of the best antivirus software to use in 2018 for securing your Windows PC.